Absolutely stunning! I read this book while at a guest lodge at 9200-feet in Dubois, Wyoming. The Dutcher's had stayed at Brooks Lake Lodge (the cozy, snowed in abode I was fortunate enough to experience) and shared a copy of their book with the staff. In my stay, I met a real-life Native American Medicine Woman who helped me 'find' my spirit guide, the wolf. Thereafter, I picked up this book and could not put it down. The detail and the similarities between pack culture and human culture amazed me. I laughed, I cried, I questioned...an entertaining and extraordinarily thought-provoking read. I have a better understanding of wolves and their role in our ecosystem after finishing this book, as well as a deeper respect for their plight. Highly recommend! these people must be crazy. A really interesting look at wolves done so respectfully by the Dutchers. A good solid read throughout but the ending just put it over the top for me emotionally. I am looking forward to watching the documentary now that I "know" the wolves. I can't wait to see them in action. The true story of the wildlife filmmaker (Jim) and employee of the National Zoo (Jamie) who met and married during a six-year project studying a pack of captive wolves who had been hand-raised in a fenced environment in Idaho’s Sawtooth Mountains, but more or less left to their own natural inclinations. Dutcher is aware of how controversial his project is (both from ranchers who see wolves as the devil and from environmentalists who think he is selfishly playing God by hand-raising wolves and interfering with them), and takes enormous pains to justify everything about it, from the fencing to the amount of relative luxury they lived in while filming (beds with sheets! Wine! The horror!). The pups are hand raised so the humans involved could safely film the wolves and give medical attention when needed; but the Dutchers go to great lengths to keep the environmental impact to a minimum – and succeed, if a government report on their impact is any indication.There’s a lot of fascinating information here, especially about the technical aspects and logistical obstacles in filming a wildlife documentary (to capture the wolves’ true feral nature, which comes off as less than majestic when close up, he films them in slow motion). There is also a great deal to learn about wolf behavior, such as how the pack hierarchy can change over time, or that physical power does not necessarily correspond to status level, or how the omega can get away with playful behavior that a mid-level wolf would be punished for (reminding me of how a medieval king would take abuse from a jester that would mean death coming from an advisor). About his colleagues with whom he falls out, Dutcher is not entirely reliable, finding fault with their position in general and painting himself (and his wife) as the lone hero against the entire irrational world. A reader does have to take an author’s word for a lot – you can’t proceed with any criticism if you can’t agree on what the author asserts – but things can’t be that black and white. Finally, the Dutcher anthropomorphize to a great extent. They note repeatedly that they are not scientists, but artists, and can only repeat what they feel and are not limited to observable repeatable phenomena; however, Jamie’s flights of fancy on how wolves respect ravens, and regret killing them by accident, are a bit much. Overall, this is a highly interesting, and unfortunately rather sad, account of a wolf pack that didn’t belong to people or the wild. Was this project a good thing, in the end? Yes, if you allow that it de-demonized wolves for many people. But maybe the subjects themselves would rather not have come to the end they did. Even though this book has a heart-wrenching ending, I enjoyed it immensely and would recommend it to any animal lover. It is beautifully written with warmth and passion. If you didn't like wolves before reading this book, you sure will afterwards. This book talks about wolves in a much different way than any of the other nonfiction books I’ve read on the subject. Reading about the Sawtooth pack through the eyes of Jamie and Jim made me feel emotionally attached to each of the wolves. It also showed me just how ridiculously difficult it is to care for a pack of wolves. A good solid read helping gain a better understanding on the subject. Review: Wolves At Our Door by Jim and Jamie DutcherThis book like others helps shed light on the old fears and myths of wolves. The book was interesting and told about a six year (1910-1996) research project on wolves in the wilderness on a twenty-five acre observation camp in the Sawtooth Mountains in Idaho. I 19ve read a few books on researching wolves and I have to say this book wasn 19t entirely as I thought it would be because they were filming a documentary on the wolf 19s behaviors, eating habits and the how each wolf had their own status in the pack. However, it was done within the twenty-five acre enclosure. Jim and Jamie Dutcher did live within the enclosure too but their sleeping area was built eight feet above the ground and I believe only one wolf through the six years made it up to the sleeping quarters and not with aggressive behavior. There was a good amount of information on different ranks a wolf holds in a pack. The Alpha is the highest rank which would be the male leader and sometimes the same pack would have a female Alpha and if so, it most likely would be the leader 19s mate. There is always a Beta in the pack which is a male wolf second in command to take the leaders place if something happens. He would use his status sometimes when the leader was not around but he also knew to be alert of the fact the leader may be near. Then at the lower ranking scale is the Omega, the lone wolf. This wolf knows his limit in the pack and takes very few chances of doing anything that would make him stick out in the pack. Most of the time he is last in eating, stays at the rear of the pack on hikes and he knows he can 19t just jump in with any playtime the wolves have unless a higher rank wolf goes to him first. Even when something goes wrong in the group and it 19s not his fault, he is still the one they attack. He is also bullied about everyday and never stands and fights, he cowers and lies on his back throughout the harassing.Meanwhile, back to the research and how the project was progressing. Like I said I don 19t believe this project was humans living in the wilderness with wolves because they were all still in a secluded fenced in twenty-five acre compound. They started out with three baby wolves that they weaned by a bottle to make that human contact and trust. Whenever Jim or Jamie was on the camp grounds the wolves would run up to them, greet them and follow them everywhere. While the sat around the camp the wolves would venture over to them with some hesitation but curiosity seemed to get the best of them. They even lay down beside them but with little human contact. As the pack grew to eight they played with Jim and Jamie by stealing their cameras, small equipment whenever they set them down only for a moment. They did show some aggressive behavior by either growling or snapping at them baring their sharp teeth but only as a warning. They never hurt any person the six years they were together. The wolves at the camp never got the feel of hunting for their own food. Jim and Jamie either went hunting deer or they were offered road-kill deer for the wolves. For me that would not be living out in the wilderness with these wolves. I do believe there was to much human contact throughout this project.After their six year funding was depleted they couldn 19t just moved them to the open wilderness because they had been in human captivity to long (even though they had twenty-five acres to roam), they would not survive. They assumed they found a great home for the wolves with the Native American, Nez Perce Indian Tribe in northern Idaho. However, after the move, being neglected, it didn 19t take long for the pack to start dying off 26There was more information about their care and short life with the tribe with only three who were saved and survived. The ending for some was a tragedy but the story does show how wolves are not aggressive predators as a lot of people believe. However, they need the wilderness, not humans to survive and multiply. They are beautiful animals. Why are they so hated by so many, soon to be gone 26..? Wolves at Our Door by Jim Dutcher is a fascinating book. It was not quite what I thought it would be due to the description, but it was still an incredible read. Jim and his companions studied the wolves as closely as possible, without ruining their wild nature too much. He wrote down everything that would be of interest to his readers; the hard obstacles they had to overcome, fellowship between companions, new life, death, how the wolves mourned for a death, how they raised their young, how hard it was living up in that forest, and how they had to raise the wolves as pups so the humans could be trusted, among other things. It amazes me how misunderstood these wonderful creatures are, and I feel like Jim knocked a chip off of the ice-burg, in realistic and truthful manner. Although some people may be more interested in books that explain people studying wolves in the wild, this book still deserves to be read. Skip the photographic _Sawtooth Wolves_ and head straight for this one. It has the whole narrative of what Jim Dutcher went through to set up the space for a pack of wolves to observe; how each wolf settled into its role; how Jim and Jamie met; the bureaucracy and hostility encountered before and after the project. (I was particularly amused by how the mandated environmental review of the enclosure concluded that the area _inside_ the enclosure had fared much better than the area outside. )I actually did appreciate all the context, even finding the story of the human romance a touching addition. Most of all, though, here is where you get introduced to each of the wolves, and gain a sense of the bond developed. It was astounding to read how the alpha female allowed a human into her den to see the pups, when she wouldn't even let the other wolves in. OMG! I cried! I have idolised Jim and Jamie for many years, and have been lucky enough to meet them in person. This is a beautifully moving account of their time spent living with the Sawtooth Pack, and having heard Jim and Jamie speak, written in their exact words. It is easy to see how their relationship develops through their mutual love for the wolves, and how they appreciate each wolf for their individual attributes. Jim''s unbreakable bond with Kamots is beautiful, and Jamie''s unlikely friendship with Lakota moved me to tears. Although I wish the ending was different, I have thoroughly enjoyed this book in its entirety, and feel as though I have really come to know the Sawtooth pack as well as Jim and Jamie do. I would recommend this to anyone who loves Wolves, and anyone who doesn't, it might just change the way you think. This book was incredible! I am surprised with my forever love of wolves that I had never heard of the Documentaries that Jim Dutcher filmed, but I was a bit young when they were released. This book was very moving and really shows how much conversation depends on many types of industries. I was not surprised that this book/films were located in Idaho, because Idaho has quite a bit of secrecy. I have lived in Idaho for almost 8 years, and have driven past Winchester and noticed the signs for WERC, but since I was always on my way to somewhere else I never stopped. Now I am going to make a special trip! There was so much emotion and personality in this book it made it really hard to put down, you want to know what happens next. I also enjoy multi-narrative books. I know this book will bruise my heart; all living with animal books do but wolves particularly. So far, it's well written from two angles. I'm willing to bet that it will make a good supplement to the documentary of the same name by the same couple. I'll add it to my list of 'movies to watch' and let you know.Fortunately this book was written by a pair of people who were very focused on presenting how they lived in harmony with the pack they looked after. There are a number of points in the book where the narrative could have taken a turn for the bitter and dark but didn't. It's a very positive read that makes tent camping in the winter in Idaho look like a June walk in the woods. It's definitely about the wolves. Wolves are...AWESOME! Thanks to Jim and Jamie Dutcher, my opinion of wolves have strengthened since I read their doccumentary. I'm not a big fan of doccumentaries since I can't keep my mind foccused. They, however, did a pretty good job! I felt like I was there with Kamots, Lakota, Matsi, Wahots, and the rest of the pack! Wolves are truly amazing creatures that God loves and designed in his own, perfect way. It makes me so happy to see two people caring about wolves so much that they are willing to go through months of planning to reintroduce these wonderful creatures. The Dutchers and the wolves had a special bond- a friendship that could not be easily broken. Their attachment was incredible! I have seen the film first. So it was nothing new in the book for me, still I found the story accompanied by beautiful pictures very entertaining. The bureaucracy was totally irritating, unfortunately such people live around the world and can ruin everything.Eventhough the research was not made on totally wild wolves I believe the facts about their behaviour were important and new, in spite of other scientistist complaining (maybe out of jealousy? ).I felt very sorry for Jim and Jamie, myself being a doglover it was difficult to imagine I would have to leave my dog suddenly, I would be very worried and very very sad. 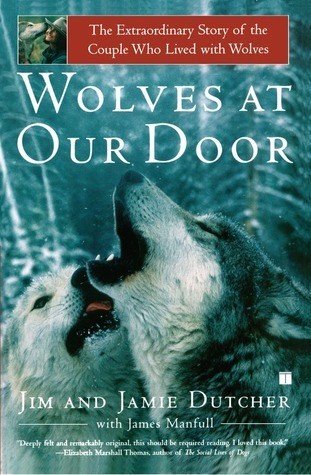 Wolves at Our Door: The Extraordinary Story of the Couple Who Lived With Wolves by Jim and Janie Dutcher (Touchstone 2002) (599.773). The authors lived in a tent in the Idaho Wilderness for six years researching this book. They lived closely with a pack of wild wolves, and they socialized and interacted with the wolves from the time that they were pups. This is quite an interesting read. My rating: 7/10, finished 2003. A companion book to the documentary of the same name, this is the story of a captive wolf pack written by the filmmakers that raised the pups and lived with them for years. As with any wildlife story there are both joy and tears involved, and some passages were difficult to read because of the latter. As I was reading this much of it sounded familiar, and I'm sure I must have seen the documentary in years past (which isn't surprising because I love wolves). Well, this book was a really good memoir of Jim and Jamie Dutcher. They both did amazing work in the way they wrote the book and it was really well thought-out and witty in some ways. I enjoyed the themes and motifs that were instilled during reading the book. Jim Dutcher wrote in a way that was unique in its own respect, but stood out in a good way, almost like a song that you would hear and immediately recognize the artist. I give this book a 3/5 stars because it was an enjoyable read. The authors did a great job detailing their experiences of living with a pack of wolves. They also wove the details of their own lives of becoming s couple. As a lover of wolves already I can't say it changed my mind about how I feel but it did deepen my understanding and respect for them. I learned a great deal about their behavior that before was unknown at least to me. A great read! I watches their documentaries about wolves and thought they were amazing (I love wolves). I bought this book not realizing that they we're the same people. I was really excited when I found it out. Their story was amazing, and it was actually pretty well-written. Knowing the backstory to everything about the people and the documentary was very fascinating. For anyone who supported members of the Sawtooth pack through Friends of the Forest or WERC, finding out what really happened to the wolves will make you sick. It was not a happy ending, and this book was a real eye opener. I have always had a fascination with wolves and saw the ABC and Discovery specials. I had to read this and it was a great story - sad in parts but well written and wonderful to feel a glimpse of what they went through. This book, about this amazing couple's project with wolves will make you fall in love, and weep, and smile. Brilliantly written, with amazing photos, it tells an incredible story about the social hierarchy of wolves. You can't help but be moved. This book was interesting and it teaches you a lot about wolves. Beyond that, the story itself is both a little inspirational and unfortunately sad. I found myself very attached to the wolves in the pack and was moved by the events that surrounded their existence. Very interesting book when coupled with the Dutcher's films. Gives behind the scenes details. A beautiful and informative read. I learned a lot about wolves. I've got a canine 4-pack at home so wolves have always interested me. Jim Dutcher James Manfull Jamie Dutcher - After an award-winning filmmaking career, Jim Dutcher turned his energies to a life-altering focus: the wolf. Armed with a Forest Service permit, he and his wife Jamie lived in a tented camp bordering Idaho’s Sawtooth Wilderness. For six years, they documented the social hierarchy and behavior of the Sawtooth Pack, wolves they bottle-fed as pups. The Dutchers’ extraordinary experiences with what they discovered to be intelligent and compassionate animals led to three Emmy Award-winning documentaries.Yet with wolves still persecuted by a mostly fearful and misinformed public, the Dutchers knew they needed to do more. In 2005, they founded Living With Wolves. A nonprofit that addresses the complex issues surrounding the historical eradication and Endangered Species reintroduction of wolves, Living With Wolves battles laws that allow the brutal hunting of these beautiful animals.